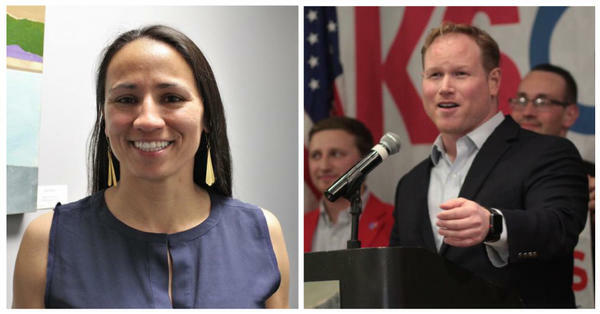 U.S. Reps. Sharice Davids and Steve Watkins officially joined Congress this week and cast votes reflecting their differences, and the split between Republicans and Democrats. “This package has previously received bipartisan support and I’m hopeful it is the path forward to ending this shutdown,” Davids said on Twitter. President Donald Trump initially supported a similar package when it passed the Senate two weeks ago. But he changed his mind when conservative pundits criticized him for backing away from his demands for $5 billion for a southern border wall. All three House Republicans from Kansas — Roger Marshall, Ron Estes and Steve Watkins — voted against the funding package. They also opposed Nancy Pelosi’s election as speaker. “As I crisscrossed Kansas’ Second Congressional District over the past year, there was a reoccurring theme among both Republicans and Democrats: they did not want to see Nancy Pelosi serving as Speaker of the House again,” Watkins said in a statement. A political newcomer from Topeka, Watkins emerged from a crowded primary to narrowly defeat Democrat Paul Davis in the 2nd District, which covers roughly the eastern third of the state. He has also asked to have his congressional salary withheld until federal workers are back on the payroll. The shutdown — now approaching its third week — affects thousands of federal workers across Kansas, from Coast Guard payroll clerks in Topeka to more than 400 employees at the Environmental Protection Agency’s regional office in Lenexa. “We’re all kind of in a standstill,” said Sara Watterson, president of the American Federation of Government Employees chapter that represents some of the furloughed EPA workers. Furloughs at the Bureau of Indian Affairs have leaders of some Kansas tribes concerned about programs that provide important services. Joseph Rupnick, chairman of the Prairie Band Potawatomi Nation, fears the shutdown will halt the delivery of food to about 100 low-income families on the reservation. “The neediest population is the one that’s affected the most,” Rupnick said. Furloughs have also forced the closure of one of Kansas’ most famous landmarks: The Brown v. Board of Education historic site in Topeka. Rob Varnum of Oklahoma City hoped to tour the site established to commemorate the desegregation of the nation’s schools with his wife earlier this week while passing through on his way home from Kansas City. Reporter Brian Grimmett contributed to this story.